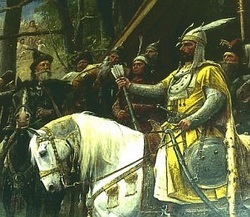 Arpad shown with a later, large, flanged mace. Something small, handy and deadly, the mace is a very useful weapon. 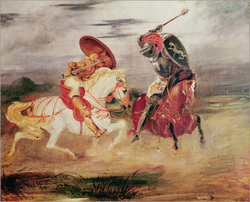 It was probably introduced from the horse-riding peoples of eastern europe but is an ancient weapon. In Scandinavia free people with any wealth rode habitually and this weapon would have been easily adopted. 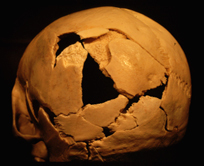 Several have been found in Viking Period graves in Gotland. easy and safe for the bearer to use on horseback. One does not have to take so much care in carrying it because there are no sharp edges and a blow which misses and hits one's own horse will do less damage than a naked blade. Despite their diminuitive size these weapons are horribly efficient. 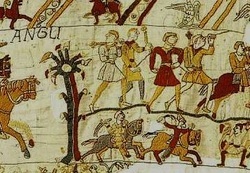 Bone not covered with thick flesh or armour will be smashed and hits in the face or to the hands are crippling. It is an ideal weapon for a close-in scrappy melee. My copies of round macehead from Gotland. There are three head-forms from Gotland, one smooth and two with projections which make them even nastier to get hit with. 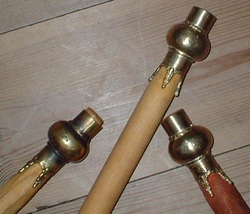 The decorative style on these examples is Scandinavian which shows the weapon was adapted and these are not chance finds that have been traded. 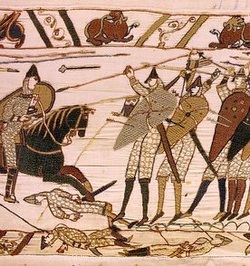 The Bayeux Tapestry includes a mace flying out of the ranks of the English towards the Norman cavalry. Later Roman infantry included maces in their weaponry and officers were equipped with one to show their rank. I found a mace-head in a castle in Hungary on the Romanian border almost identical to one from Gotland along with two Scandinavian swords. If maces could travel so far west then swords could obviously make their way east.